Joseph Priestley, best known for his work as a chemist and for his discovery of oxygen, was born on March 13, 1733. He received his early education from Bately Grammar School and in 1752 entered Daventry Academy, graduating in 1755. From there, he went on to become assistant to the independent minister, John Meadows, in Suffolk. He developed an interest in Unitarianism and began his own ministry in September of 1758 in Cheshire. In 1761, Priestley went on to Warrington Academy as a tutor of English, history, and anatomy. While at Warrington, he began his life-long friendship with poet Anna Aikin, later Anna Barbauld, and was ordained in May 1762. On June 23rd of that same year, Priestley married Mary Wilkinson. Though it was not until about the 1770’s that Priestley began to receive public recognition for his work as a scientist, it was here at Warrington that he first developed his interest in the sciences: spending much time with his students in the field studying and collecting fossils and other botanical specimens, collecting instruments such as air pumps and globes for his later experiments, and beginning his work with and study of electricity. He was perhaps the first to use large batteries in his experiments. In June of 1766, he began experiments to explain the rings which appeared on metallic surfaces as a result of electrical discharges, the oscillatory nature of the discharges from Leyden jars, and to measure electrical resistance. In February 1767, he published his findings as The History and Present State of Electricity, later translated into Dutch, French, and German. Following Priestley’s studies with electricity, he began his work with “mephitic air,” or air containing carbon dioxide. Eventually, Priestley’s work with different kinds of air led him to the discovery of oxygen, which he called “dephlogisticated air,” using his burning glass, an apparatus now on display in the May Morris Room of Dickinson College. In August of 1774, Priestley determined oxygen’s properties and its importance in maintaining the respiration necessary for life. 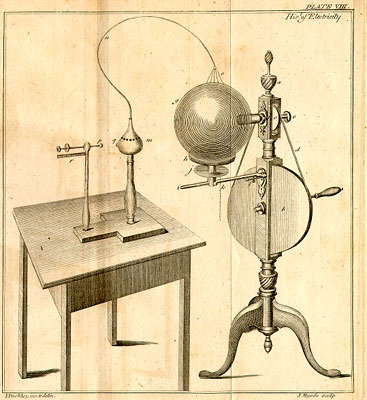 Priestley’s other experiments during the 1770’s studied the properties of vegetables growing in light and the properties of water and air. Through such experiments, Priestley concluded that water was the basis for all air. Priestley discussed his work with many of his colleagues: Matthew Boulton, James Keir, James Watt, William Withering, and Eramus Darwin, whom he met with monthly in a group known as the Lunar Society. The Lunar Society sought to transform the face of England materially, socially, and culturally through their discussions of pure and applied sciences. Priestley also exchanged data and specimens with Claude Louis Berthollet, Joseph Banks, Richard Kirwan, Peter Woulfe, and Karl Scheele. In October of 1774, he met with Lavoisier to tell him of his experiments with dephlogisticated and phlogisticated air; Lavoisier in turn repeated his experiment to confirm Priestley’s findings. Priestley spent the remainder of his years in England experimenting with the effects of various gases such as oxygen, carbon monoxide, laughing gas (nitrous oxide), and carbon dioxide on mice and other animals, studying the substances of iron, carbon, glass, ivory, diamonds, and various other minerals and acids. In 1772, he published The History and Present State of Discoveries Relating to Vision, Light, and Colours , a work speculating on the luminous quality of various animals and plants, such as glow-worms, and the cause of rainbows, halos, and other such luminous phenomena in the atmosphere. In 1791, rioters burned Priestley’s house and laboratory in Birmingham, along with the homes of other religious dissenters and scientists: William Withering, John Ryland, John Taylor, George Humphry, among others. In April of 1794, Priestley left England for America aboard the Sansom. Once in America, Priestley settled in Northumberland, Pennsylvania, and continued his experiments. During the summer of 1803, Priestley experimented with the growth of algae in order to disprove Erasmus Darwin‘s ideas about spontaneous generation. Priestley also contested Darwin’s evolutionary ideas, thinking that plants and animals could arise only from pre-existing germs of the same matter. Priestley’s beliefs that various kinds of animal and vegetable matter not visible to the naked eye floated in the atmosphere were later proven by Pasteur. Among Priestley’s most influential friends and colleagues were Benjamin Rush, Thomas Cooper, Benjamin Franklin, and Thomas Jefferson. Priestley’s last and final paper, on nitric acid in the atmosphere as it is carried down by snow was published in November 1803. On February 6, 1804, Priestley died, leaving a powerful and lasting legacy of scientific work and discoveries.